Thisstory was updated on Jan. 5. The plannedpredawn launch of the space shuttle Endeavour next month may be the first orbiterflight this year, but it is one of just five remaining missions before NASA isslated to mothball its space plane fleet this fall. Endeavouris scheduled to blast off on Sunday, Feb. 7 at 4:39 a.m. EDT (0939 GMT) fromNASA's Kennedy Space Center in Florida to begin a long-awaited delivery missionflight to the International Space Station. The cargo: a new connecting moduleand giant bay window for the orbiting laboratory. Thespaceflight will be NASA's 130th mission for the aging shuttle fleet, which hasbeen flyingsince 1981. Endeavour is due to head out to its launch pad early Wednesday. NASAcurrently plans to retire Endeavour and its sister ships Atlantis and Discoveryin the fall of this year after completing construction on the $100billion space station. Their replacement, the capsule-based Orion ship andits Ares I booster, is not slated to begin operational flights until 2015 atthe earliest, and potentially later. NASA currently plans to fly astronauts onRussian Soyuz vehicles, and possibly commercial spacecraft, during the interim. NASA officialssaid last year that the months of margin to cope with delays between shuttleflights has dwindled to a couple of weeks at the most. But they remainconfident that what remains should be enough, barring any unexpected ? andlarge-scale ? issues in the missions to come. NASA'sfirst flight of 2010 promises to give astronauts on the space station a wholenew view of their home planet when the shuttle Endeavour delivers theTranquility module, formerly Node 3. The mission is slated to launch on Feb. 4with veteran astronaut George Zamka in command. "Thisflight will, I think, grab the public's attention," said Kirk Shireman,NASA?s deputy station program manager. "It's just going to be a really,really neat module for those on board." Tranquilityis the module TV comedian Stephen Colbert hoped would bear his name and thelast major addition to the station from the United States. The funnyman host ofComedy Central?s Colbert Report even won an online NASA vote to name the moduleby encouraging fans to write his name in. In the end,NASA opted to christen the new module after Tranquility Base, the moon baseestablished by Apollo 11 astronauts during the historic first manned ?landingin 1969. However, the Tranquility module will house an exercise treadmill namedafter Colbert ? a consolation prize from NASA ? and other life support gear. ButTranquility's main cool factor stems from the seven-window cupola that willserve as an observation portal for astronauts inside the station. The windowswill prime views of the station exterior during robotic arm work and spacecraftarrivals and departures. "Thedream of being able to go out and just have an unencumbered view of space ?we'll have it," Shireman said. Currentlyslated to launch on March 18, the shuttle Discovery will carry a cargo poddesigned to attach to the space station like an orbital walk-in closet soastronauts can deliver a pantry full of supplies. U.S. Navy Capt. AlanPoindexter will command the mission. At theheart of Discovery's space station deliveries is a set of experiment rackscontaining new gear to observe how the bodiesof astronauts change in space, as well as observe the Earth far below. A windowobservational research platform will add cameras, sensitive scanners and othersensors to the Earth-facing window in order to monitor climate changes, seaformations and crop weather damage on a global scale. An exercise system rackcalled MARES will also be packed aboard Discovery. It is designed to study howhuman muscles atrophy in the weightlessness of space by measuring changes inthe strength of bones and muscles over time. Discoverywill also deliver a sleeping berth the size of a phone booth that will serve asstation astronaut's bedroom, NASA officials have said. The shuttleAtlantis is expected to end its spaceflying career with the STS-132 mission, aflight that will deliver a new Russian room and European robotic arm to thespace station. Navy Capt. Ken Ham will command the flight. Slated tolaunch on May 14, the mission will deliver the Mini-Research Module 1 (MRM-1)for Russia's Federal Space Agency. Despite its name, the module will actuallybe Russia's second small addition to the station since its counterpart, MRM-2,will launch atop an unmanned rocket in Fall 2009. Both mini-research moduleswill be attached to different parts of the station's Russian-built segment anddouble as docking ports for Russian spacecraft. The extrarobotic arm aboard Atlantis was built for the station by the European SpaceAgency (ESA). It is designed to pluck experiments out of a Russian airlock andattach them outside the station, use infrared cameras to inspect the outpost'sexterior and help move astronauts into position during spacewalks, according tothe ESA officials. The missionwill be the 32nd and final flight for Atlantis. In afitting finale, NASA's last space shuttle flight will fly is expected to be onethat was never supposed to fly. It is STS-134, an extra mission tacked on tofly a long-awaited Alpha Magnetic Spectrometer, a $1.5 billion particle physicsexperiment that was shelved after the 2003 Columbia shuttle disaster. The massivespectrometer weighs a whopping seven tons and is designed to detect cosmic raysand measure their charge, momentum and velocity.The U.S. Department of Energy-led experiment includes 16 internationalpartners. Researchers hope the powerful spectrometer will be able to measureantimatter and the remnants of the theoretical Big Bang that gave birth to theuniverse. The missionis slated to launch on Sept. 16 aboard the Discovery orbiter - the oldestremaining shuttle after the tragic losses of Challenger and Columbia in 1986and 2003, respectively. It will mark an end to what will be just over 29 yearsof U.S. space shuttle flight. "I'msure it will be emotional," NASA's shuttle program manager John Shannonsaid in a statement. "But I suspect that it will not be sadness over thepassing of that era, but happiness that we were a part of it." The flightwill be Discovery's 39th and last mission. Endeavour'sfinal flight is expected to ferry more vital spare parts to the InternationalSpace Station as well as a cargo pod packed with supplies. The mission is slatedto launch on July 29. "Itisn't glamorous, but it's really important for the space station to execute itsmission," Shireman said of the flight. Chief amongthe shuttle's cargo will be a debris shields for the station's Russian-builtZvezda module and extra antennas for its S-band communications system. Extracircuit breaker boxes, cooling system gear and a spare arm for Canada'smaintenance robot Dextre - a multi-limbed mechanical repairman - will also beonboard mission managers said. The cargopod, formerly known in NASA parlance as a Multi-Purpose Logistics Module, isexpected to be left aboard the station to serve as an extra walk-in closet tostore supplies and equipment. It has been refitted to stay in spacepermanently. A series ofthree spacewalks are scheduled to deliver the spare station gear. The missionis also expected to test a new navigation sensor that could be tested on Orion.It will be the 25th mission for Endeavour, which is NASA's youngest orbiter,and will also mark the endof construction for the International Space Station. Assemblybegan in 1998 with the launch of Russia's Zarya control module. When complete,the station will contain large rooms and laboratories from the U.S., Russia,Japan and Europe, a robotic arm and maintenance robot from Canada and drawpower from a set of expansive solar array that give the orbiting laboratory awingspan that could cover an American football field. Even unfinished,the space station can easily be spotted from Earth by the unaided human eye. 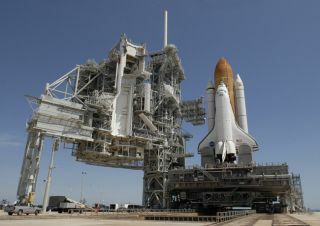 "Theassembly of the space station could not have been done without the spaceshuttle, and the assembly of the space station is one of the great engineeringachievements of mankind," Shannon said. "So the space shuttle willhave done a good job."